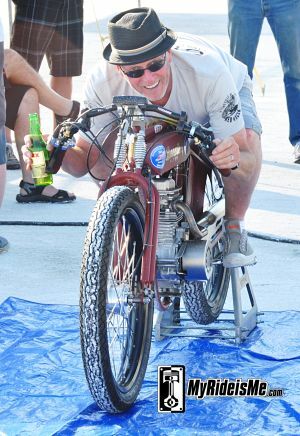 Willie Boelcke looks happy because he is! Not only has the rain dried up from yesterday, his “Low Sodium” racer ran 239.158 mph against the B/FRMR roadster record of 235.436 mph set at Speed Week in 2009. You’d be smiling too! Willie’s roadster already holds the C class record so now he’s doing what alot of racers do and adding cubic inches to go for another record. The A-engine class might be next since that record’s only 207! (someone build an A engined FRMR and get a red hat!! Here’s a look at what used to be a 1927 Ford Roadster. See the painted part? Tomorrow, at 7AM, Willie and the other folks who beat the existing record speed will head to the front of the line to try and back up their record and officially break it. I know nothing about this bike, but couldn’t resist the photo-op. Notice a trend here? The happy folks trying to set records enjoying a cold one after a long day in the sun. One record qualifying run predicted in this story about the 1952 Buick Super Riviera called Bonneville Bombshell, came true for Jeff Brock. 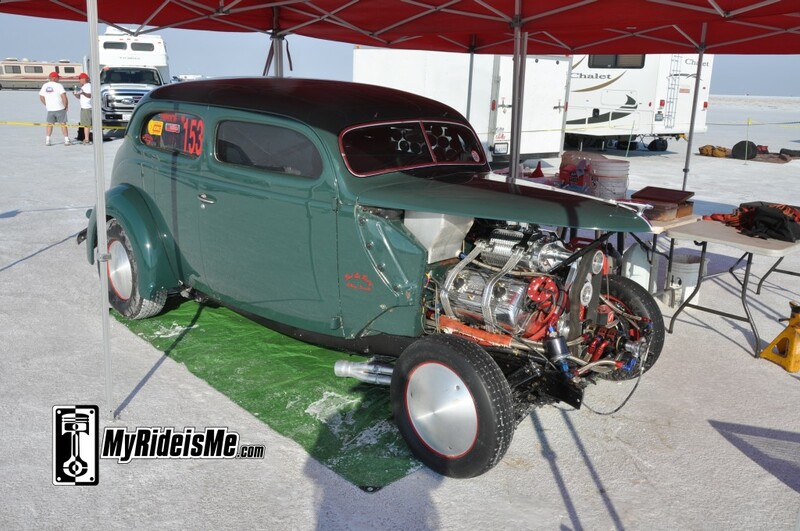 Certainly a crowd favorite, Jeff’s Buick looks cool and certainly runs hard. The Bombshell runs a Buick Straight 8 in the XO/GCC class. 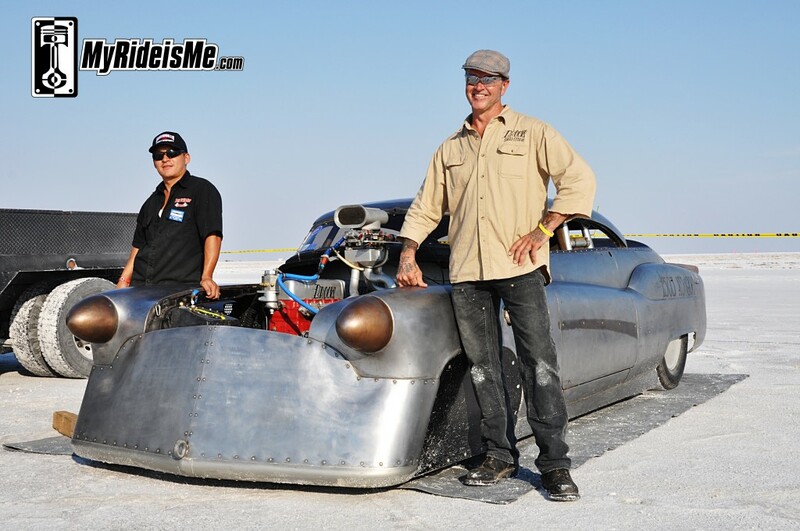 Running on his own record set in 2010 at 141.821 mph, he bumped that to 155.852 with help from the air-slicing front end made by flipping a 1959 Dodge bumper. Jeff whispered, “I missed a shift bad!” So tomorrow, look for the record average to be set higher than 155! Turns out, this photo on the right is Gunther Maier. He’s the talented photographer who did quite a few of the photos of the ‘Bombshell below. He’s out set’n records too! Hey look! Jeff’s smiling too! 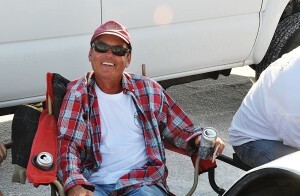 His crew chief Serge even crack a little smile! Jeff’s beer of choice was Mondelo. It sounds beastly too! If you’re wondering, the hand-fabbed intake shown here held several records at Bonneville before running on Jeff’s Buick. Pretty don’t make it fast! Here’s a couple more record qualifiers. 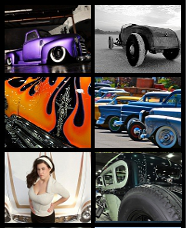 There were only nine qualifiers on Saturday 8/11/2012 for the “car” classes. Track’s a little wet still, tomorrow there’ll be more. 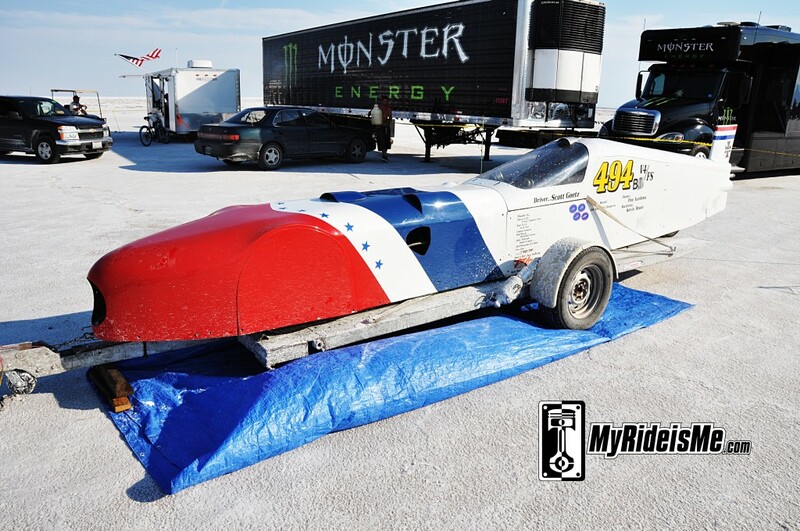 This is AArdema-Braun-Goetz V4/BGS “Blown Gas Streamliner in impound for running 224.657 mph. Get this, the record for that class is only 86 mph. I’m guessing they’ll back it up, but will they get a red hat? 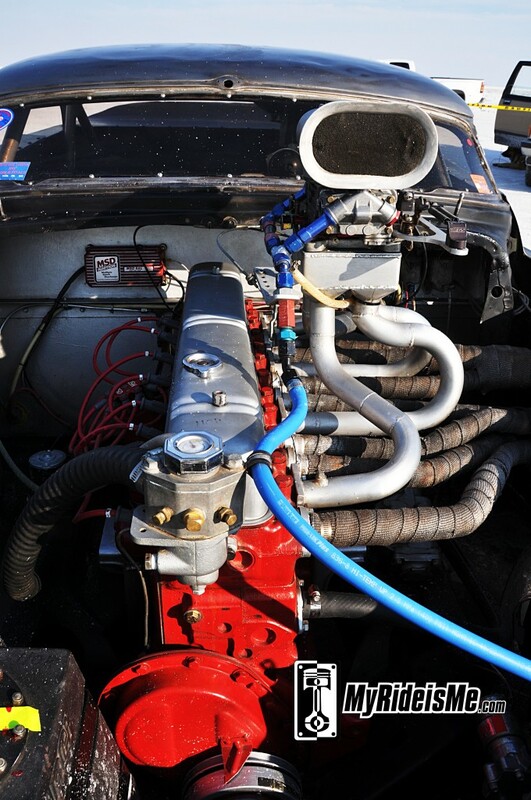 Sticking with the vintage engine category, this is a XXF class motor, known to hot rodders as a Ford flathead. This one sports the rare and desireable Ardun heads and a blower. The Ferguson and Osborn team are trying to break their own record from 2011 bumping it from 147.719 to a qualifying 160.915 mph. I’ll try and get a shot of this cool hot rod with it’s face on tomorrow. If there’s 70 qualifiers tomorrow, look for them here at MyRideisMe.com! You are the only sight to give any info on who ran and who did what at speed week 2012. Thanmk you very much for the info and keep on clicking off the info. Cool stuff Pike! I love the Buick this year with its new nose. Love that paint on the low sodium roadster as well. 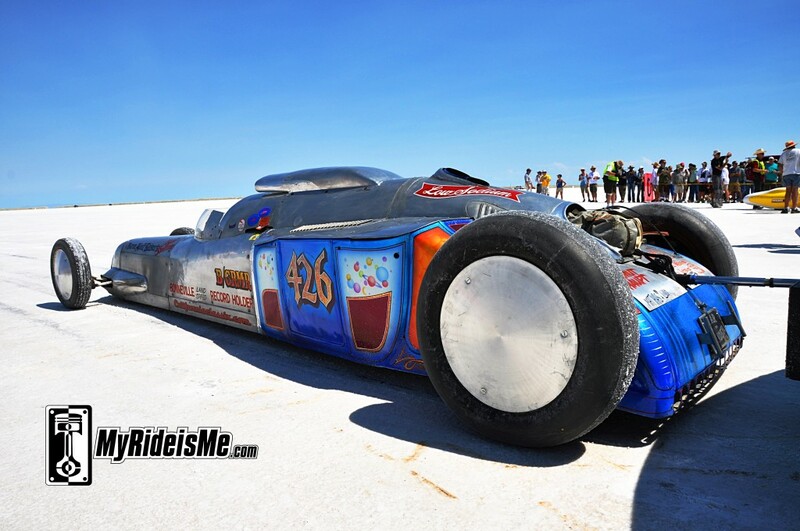 Thanks to you I am able to enjoy Bonneville this year. I had fully intended to be there, but things happen and at 70 I still want to make that first trip. Thanks for your great coverage. What a KILLER Speedweek event. Thanks Craig Pike and MyRideisMe ! It is always a pleasure to hang with you folks. Thanks for posting those fine pix and the info! I actually made it into the prestigious “Bonneville 200mph Club” on Sunday with my “Low Sodium” Roadster – average of 245.506mph was good for a brand new “Red Hat” – happy happy joy joy! !